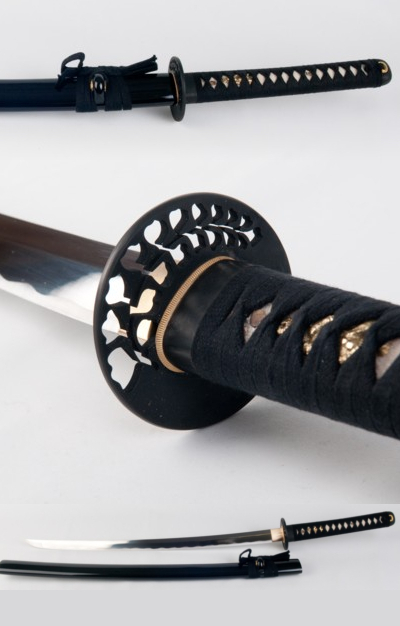 Stainless steel blade, unsharpened with hamon 24 inches from tip to tsuba, without bo-hi. Overall length including saya about 35 inches. The Ito is Black cotton over White Rayskin. Tsuka is double pinned with bamboo mekugi, cotton Ito wrapped with hishigami paper. Iron Wisteria design Tsuba. Weight without saya 2.05 lbs. Saya is wood with high gloss Black lacquer finish. 3 pc bullhorn, Black Cotton Sageo. Handmade. Brand new. Comes with cotton sword bag. This sword is not intended to be used for cutting.